It’s the type of ratings that any boxing executive would kill for—and the type of exposure that helps at least partially justifies Deontay Wilder’s choosing autonomy over money. The unbeaten heavyweight titlist was prominently featured in CBS’ “NCAA Final Four Basketball—Bridge” segment in between Saturday’s pair of tournament semifinals games. The show averaged 13.77 million viewers according to Nielsen Media Research, making it the second most-watched primetime telecast for the week of April 1-7, trailing only Texas Tech’s win over Michigan State. Wilder (40-0-1, 39KOs) was on hand in Minneapolis to take in the Final Four action, in part to root for the Auburn Tigers—traditionally the archrival of his locally-based (Tuscaloosa, Ala.) University of Alabama. Still, he felt compelled to support his home state, complete with defending Auburn’s falling prey to a late controversial call in contributing to their 63-62 semifinals loss to the Virginia Cavaliers, who went on to win the tournament championship Monday evening. The platform also provided him the opportunity to discuss his May 18 title defense versus Dominic Breazeale. The bout air live on Showtime, a wholly owned subsidiary of CBS Corporation (who also owns BoxingScene.com). “Showtime—and in particular Stephen Espinoza (president of Showtime Sports)—facilitated Deontay’s appearance on the show,” Timothy Smith, vice president of communication for Premier Boxing Champions (PBC) told BoxingScene.com. “He worked with CBS Sports to make it happen. It’s part of an overall strategy to introduce the only American heavyweight champion to the American sports fan. The marketing strategy was instrumental in marketing several PBC athletes during the rebranding of its ongoing series on Fox Sports platforms. The relaunch was timed with the tail end of the 2018 National Football League (NFL) regular season and its early-round playoff coverage, leading to favorable ratings for its PBC on Fox primetime shows on December 22 and January 26 as well as the January 13 edition of PBC on FS1. The platform also helped successfully drive sales for Fox Sports’ first-ever pay-per-view event in March, when Errol Spence dominated fellow unbeaten pound-for-pound entrant Mikey Garcia over 12 rounds in their welterweight title fight. Both boxers were regularly featured during NFL games on Fox, particularly games at Dallas Cowboys’ AT&T Stadium in Arlington, Tex. which housed the PPV event along with the 47,000 or so in attendance. Such exposure factored into Wilder’s decision to stay put with PBC—and the relationships with Showtime and Fox Sports that go along with it—rather than give into the lure of lucrative offers from ESPN/Disney and standalone sports streaming service DAZN. The latter platform offered a contract that suggested the ability to make in the vicinity of $100 million, although largely dependent on Wilder scoring a pair of fights with unbeaten, unified heavyweight titlist Anthony Joshua. He ultimately declined, instead opting to stick with a program and marketing strategy he wholly trusts—and one which has always loved him back. 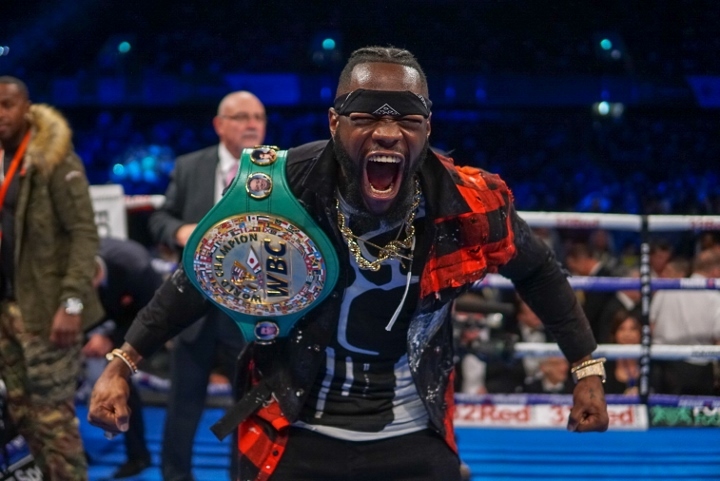 Wilder has consistently served as Showtime’s biggest boxing draw, twice exceeding one million viewers in headlining bouts on the premium cable outlet. His Jan. ’15 title winning effort over Bermane Stiverne drew an average of 1.24 million viewers, peaking at 1.34 million viewers. Last March, the 2008 Olympic Bronze medalist and long-reigning heavyweight titlist saw an average of 1.1 million viewers tune in for his thrilling 10th round knockout of Luiz Ortiz. From there came his debut in the PPV market, with last December’s thrilling 12-round draw versus Tyson Fury selling 325,000 units. A fight-week clip of Wilder’s exchange with BoxingScene.com videographer ‘Radio’ Rahim Davies immediately went viral, with his ‘Till This Day chant continuing to trend worldwide—even among those who’ve never before seen him in the ring. “Wilder has a bigger than life personality and real star quality,” notes Smith. “With his natural charisma and charm and explosive knockout power, he is the heir to the lineage of great American heavyweight champions – Jack Johnson, Jack Dempsey, Joe Louis, Rocky Marciano, Muhammad Ali, Larry Holmes, Mike Tyson and Evander Holyfield. The more people who get to know him, that’s more people who will come along for the ride. With a pool of nearly 14 million viewers from which to choose, it’s the type of cross-promotion that few other platforms can provide.